Summer’s not over yet! 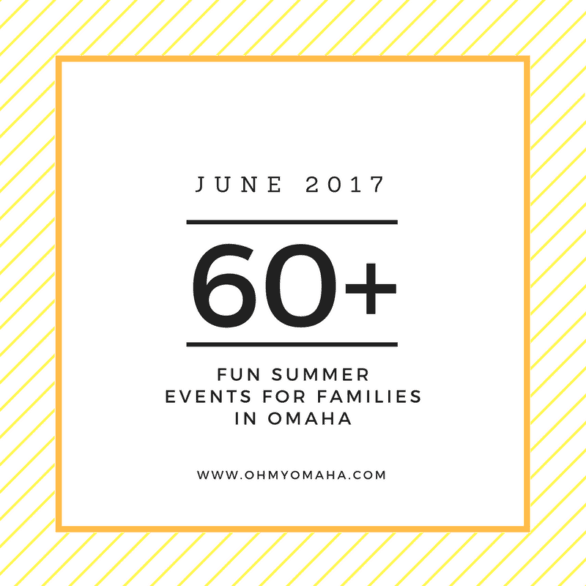 Get and have some fun with the following family-friendly events in August happening all around the Omaha metro area. Looking for FREE movies and concerts this summer? Head over to the post 100+ Free Summer Movies & Concerts. Prefer nature to the crowds at events? 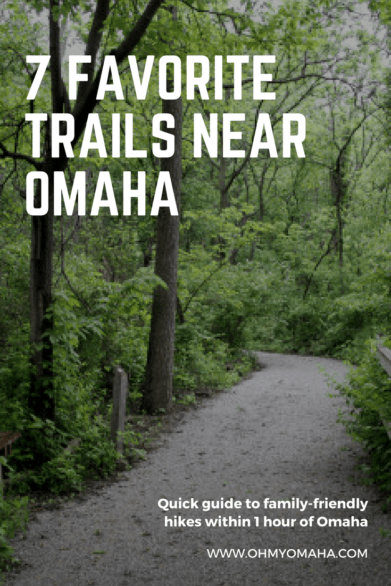 Here are 7 Favorite Trails Near Omaha. When: Aug. 1, 4:30 to 6 p.m.
Where: Kids Can Community Center, 4860 Q St. When: Aug. 1, 5:30 to 7:30 p.m. When: Wednesdays, Aug. 2, 9, 16, 23, and 30, 11 to 11:30 a.m. When: Aug. 2 (last names M-Z), 1:30 to 7 p.m. When: Aug. 4, 10 to 11 a.m. When: Aug. 4, noon to 4 p.m.
Where: AIM Brain Exchange, 1902 Howard St. When: Aug. 4, 4 to 7 p.m.
Where: Hanscom Park, 3201 Woolworth Ave. When: Aug. 5 and 6, 9 a.m. to 5 p.m. When: Aug. 5, 10 a.m. to 1 p.m. When: Aug. 5, 10 a.m. to 2 p.m. When: Aug. 5, 10 a.m. to 5 p.m. When: Aug. 5, 11 a.m. to 3 p.m.
Where: Bemis Center for Contemporary Arts, 724 S. 12th St. When: Aug. 5, 11 a.m. to 4 p.m.
Where: Lee G. Simmons Conservation Park and Wildlife Safari, 16406 N. 292 St., Ashland, Neb. When: Aug. 5, 2 to 3:15 p.m. When: Aug. 5, 6 to 9 p.m. When: Aug. 7, 2 to 3:30 p.m.
Where: South Omaha Library, 2808 Q St. When: Aug. 10, 4 to 5 p.m. When: Aug. 11-13; Friday and Saturday, 11 a.m. to 11 p.m., and Sunday, 11 a.m. to 4 p.m. When: Aug. 12, 1 to 3 p.m.
Where: Omaha Public Library A.V. Sorensen Branch, 4808 Cass St. When: Aug. 12, 3 to 9 p.m.
Where: Beautiful Savior Lutheran Church, 7706 S. 96th St., La Vista, Neb. When: Aug. 12, meet at 8:30 p.m. When: Aug. 16, 3 to 4:30 p.m. When: Aug. 18-20; Friday from 5 to 11 p.m., Saturday from 11 a.m. to 11 p.m., and Sunday from 11 a.m. to 7 p.m.
Where: St. John’s Greek Orthodox Church, 602 Park Ave. When: Aug. 19, 6 to 9 p.m. When: Aug. 12, 10 to 11 a.m. When: Aug. 18, 2 to 4 p.m. When: Aug. 18, 8 to 11 p.m.
Where: Neale Woods Nature Center, 14323 Edith Marie Ave. When: Aug. 19, noon to 5 p.m. When: Aug. 20, 10 a.m. to 3 p.m. When: Aug. 22, 1 to 2 p.m. When: Aug. 24, 4 to 5 p.m. When: Aug. 26 and 27, 11 a.m. to 6 p.m.
Where: Bellevue Berry & Pumpkin Ranch, 11001 S. 48th St., Papillion, Neb. When: Aug. 27, 5:30 to 8 p.m.
Where: Majestic Cinema of Omaha, 14304 West Maple Road; Village Pointe Cinema, 304 N. 174th St.; and Twin Creek Cinema, 3909 Raynor Parkway, Bellevue, Neb. Where: Film Streams’ Ruth Sokolof Theater, 1340 Mike Fahey St. 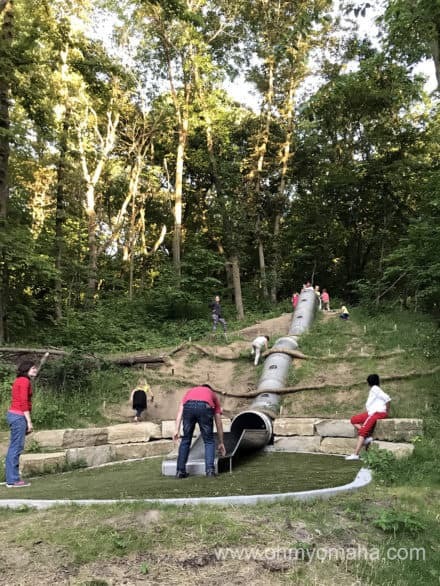 When: Wednesdays, through Aug. 30, 3:30 to 5:30 p.m.
A limestone crushed trail at Heron Haven, located in the center of Omaha. Why: Head here if you want a taste of nature but you’re short on time. This pretty wetland sanctuary in the heart of the city feels like an escape once you’re in the thick of it, but it’s not very large (so it’s great for little legs). Definitely venture to the little boardwalk over the pond. Read more about Heron Haven here. Tip: Heron Haven has monthly kids on the second Saturday of the month. One of the slides at Hummel Park in Omaha. Why: This city park has easy to somewhat difficult trails, plus a nice visitor center. There are some interesting features on trails, like the stairs that no one seems to agree on the number of them, plus two cool new slides. Tip: Omaha City Parks & Recreation holds quite a few FREE activities each year, that you should check out! My family has done a firefly night event and the Halloween themed one. 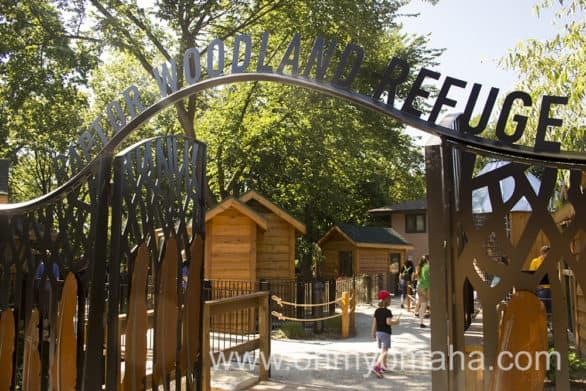 The entrance to Fontenelle Forest’s Raptor Woodland Refuge in Bellevue, Neb. 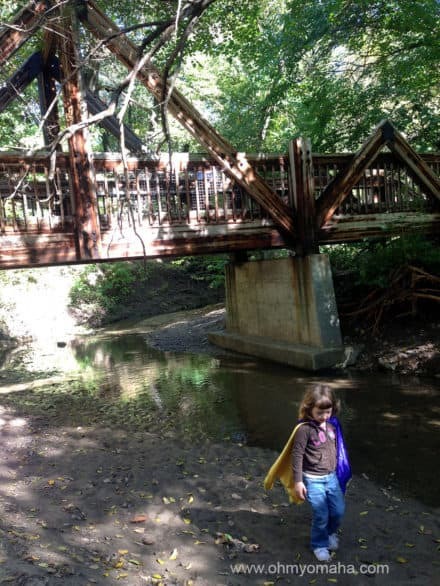 Why: Fontenelle Forest has 26 miles of trails, including the area’s best accessible boardwalk that makes it easy for wheelchairs and strollers to go deep into the woods. They also have Acorn Acres, a great children’s outdoor playscape, and the new Raptor Woodland Refuge space that my kids insist we see each time we’re there. Tip: While these trails have more signs posted than others, grab a map before heading out on your hike. An easy trail at Hitchcock Nature Center in Honey Creek, Iowa. 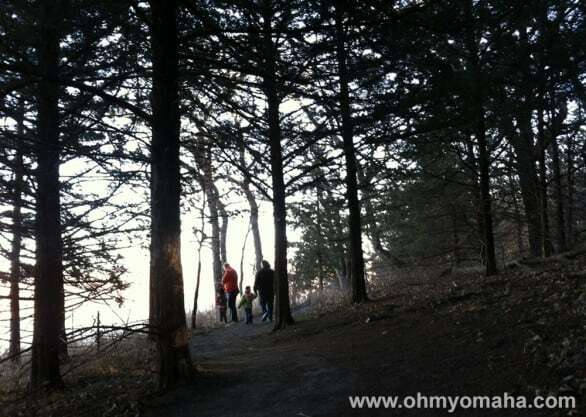 Why: This park tucked in the Loess Hills is beautiful in any season. You’ll find 10 miles of trails with a good mix of easy ridge lines and difficult, rugged trails, plus an accessible boardwalk. The visitor center is top-notch, and there’s a lookout tower that kids enjoy. Time a visit well and participate in the Hawk Watch. Read more about fall at Hitchcock here. Tip: Check out a backpack at the visitor center. They’re free to borrow, and include kid-friendly items to enhance your hike. One of the bridges found along the trail at the Tree Adventure. Why: The South Table Creek Trail at the Tree Adventure is a favorite of my family. It has a couple bridges, some fun kids structures, and a bird sculpture-spotting game. In addition to the trail, we love the outdoor education center and tree house there. Read more about the Tree Adventure here. There is a paved trail and a dirt trail here. Tip: There are frequent special events held at the Tree Adventure, so check the calendar to time a fun visit. 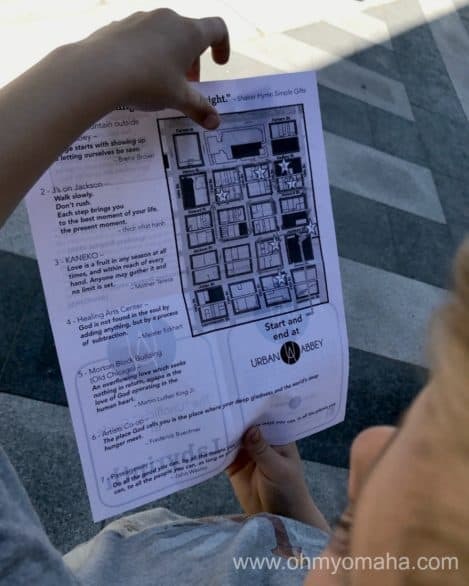 We visited one time when there was a gnome scavenger hunt! Why: This is one of my family’s favorite Nebraska State Park, with a good variety of easy to difficult trails. A favorite is the very short, flat trail to a waterfall. It’s a tough call which park, Platte River or Hitchcock, have the best terrain for hikes out of this list. Read more about Platte River State Park here. Tip: Bring a map with you when exploring these trails. There aren’t a whole lot of signs out there, and you can end up taking a much longer hike than anticipated. Why: This state park is full of things to do. It’s not a particular great place for hiking, but there are some trails and they are pretty easy. There’s a paved path around the park, too, though it’s not very shade. One highlight for kids is the trail near the lookout tower, which leads you to an overlook where you might catch a train passing by. Tip: Bring a swimsuit and cool off at the park’s amazing aquatic center after your hike. Or, keep the trail theme going and go on a horseback ride at Mahoney. Want MORE ideas for hikes? 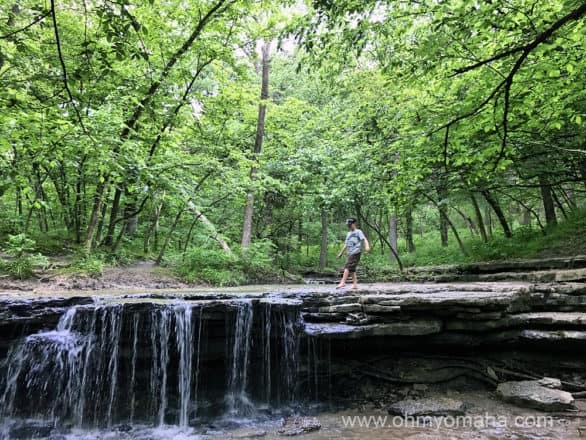 Read 3 Places To Hike In The Loess Hills! 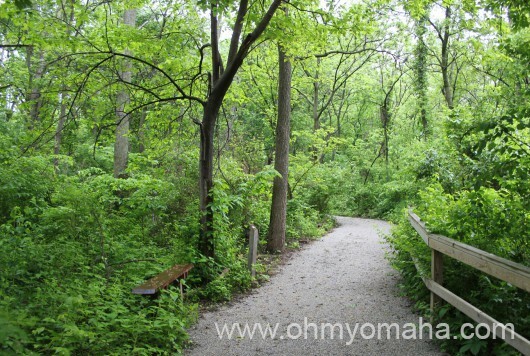 Summer is the best time to get out and explore Omaha. 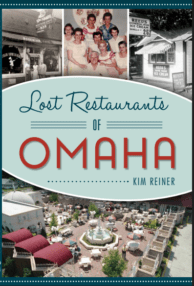 Looking for a memorable night in Omaha? This list has a lot of them. 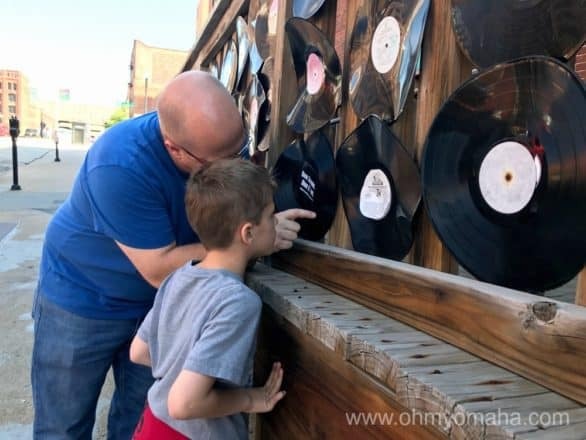 If you’re looking for free things to do in Omaha, you’re also in the right place – there are a lot of free summer events in Omaha this June for families! Want more ideas? 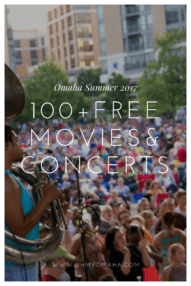 See this list of 100+ FREE movies and concerts this summer! When: June 1 (Omaha Children’s Museum Amazing Bubble Show), June 8 (Jeff Quinn, magician),June 15 (Raptor Recovery),June 22 (Omaha Children’s Museum Whiz Bang Science Show), June 29 (Wildlife Encounters), July 6 (Omaha Children’s Museum Mad Scientist Show), July 13 (Lemon Days – Meet Peppa Pig), July 20 (Jef Quinn, magician), and July 27 (Omaha Street Percussion) ; 10 to 11 a.m.
Where: Rose Theater, 2001 Farnam St. When: June 2, 5 to 7 p.m.
Where: Sumtur Amphitheater, 11691 S. 108th St., Papillion, Neb. When: June 3, 7:45 to 10 a.m.
Where: Village Pointe, 17305 Davenport St. When: June 3, 9 a.m.
Where: Iowa School for the Deaf, 3501 Harry Langdon Blvd. When: June 3, 11 a.m. to 4 p.m. When: June 3, 1 to 3 p.m. When: June 3, 5 to 8 p.m. When: June 3-4; performances are Saturday, 2 and 8 p.m., and Sunday, 1:30 p.m.
Where: Do Space, 7205 Dodge St. When: June 6, 1 p.m. When: June 7, 6 to 8 p.m.
Where: Benson Park, 7028 Military Ave. 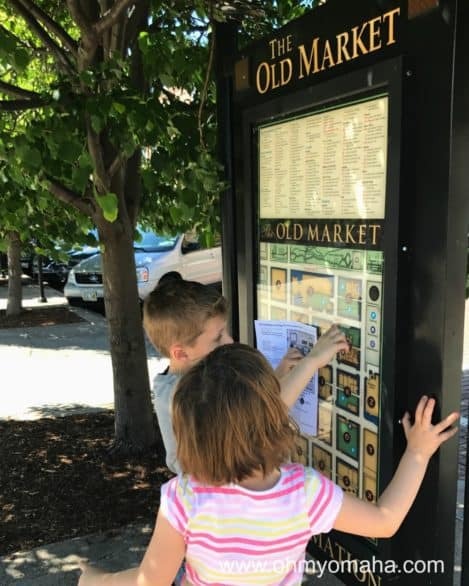 When: June 9-11; artists’ market open Friday & Saturday, 11 a.m. to 8 p.m. and Sunday, 11 a.m. to 5 p.m., and children’s fair is Saturday, 11 a.m. to 6 p.m. and Sunday, 11 a.m. to 5 p.m. When: June 10 and 11; Saturday, 10 a.m. to 8 p.m., and Sunday, 11 a.m. to 5 p.m.
Where: Baxter Arena, 2425 S. 67th St. When: June 10, 10 to 11 a.m. When: June 10 and 11; Saturday at 1:30, 4:30 and 7:30 p.m., and Sunday at 1, 3:30 and 6 p.m.
Where: Sarpy County Museum, 2402 Clay St, Bellevue, Neb. Where: Child Saving Institute, 4545 Dodge St. When: June 16 – Oct. 14; Tuesday – Friday, noon to 8 p.m., and Saturday, 11 a.m. to 5 p.m.
Where: CenturyLink Center, 455 N. 10th St.
Where: TD Ameritrade Park, 1200 Mike Fahey St.
Where: Elmwood Park, 802 S. 60th St. When: June 17, 11 a.m. to 3 p.m.
Where: Nebraska Crossing Outlets, 21209 Nebraska Crossing Drive, Ste C100,, Gretna, Neb. When: June 17, 1 to 3 p.m. When: June 17, 2 p.m.
Where: Omaha Public Library Washington branch, 2868 Ames Ave. When: June 19, 5 to 8 p.m. When: June 22, 1 to 2 p.m. When: June 22, 7 p.m. When: June 22-June 25, 9 a.m. to 5 p.m. When: June 23, 2 to 3 p.m. When: June 23, 7 to 10 p.m.
Where: Stinson Park at Aksarben Village, 2285 S. 67th St. When: June 24, 10 a.m. to 2 p.m. When: June 24, 12:30 to 3:30 p.m. When: June 24, from 3 to 10:30 p.m.
Where: Turner Park at Midtown Crossing, 3110 Farnam St. When: June 24, 7:30 to 9 p.m. When: June 25, noon to 4 p.m. When: June 26, 5 to 8:30 p.m. When: June 29, 3:30 to 4:30 p.m. When: June 30, 10:30 to 11:30 a.m.
Where: Memorial Park, 6005 Underwood Ave. When: Through June 25; performances are Wednesday–Saturday, 7:30 p.m., and Sunday, 2 p.m. Saturday matinees at 2 p.m. on June 17 and June 24. Cost: $42, adults (Thursdays – Sundays) and $25 for students (Thursdays – Sundays). Tickets are $32 for adults and $20 for students on Wednesdays. Don’t miss additions to this list! 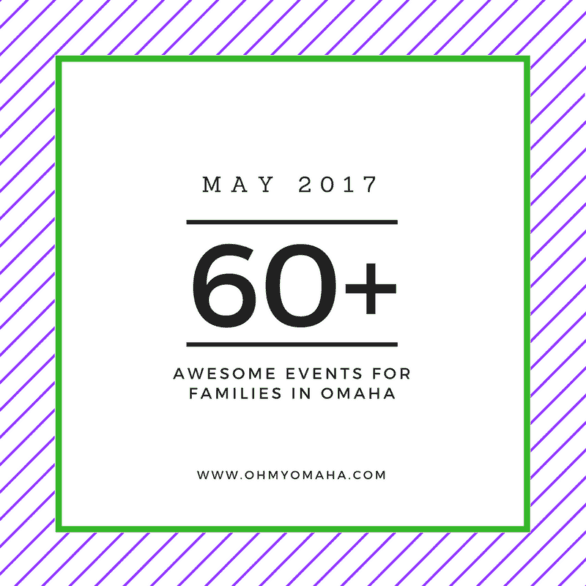 May’s a great month to get out and do things in Omaha. There’s now more going on outdoors, at farms and farmers markets, plus parades and festivals are starting up. Have fun exploring! 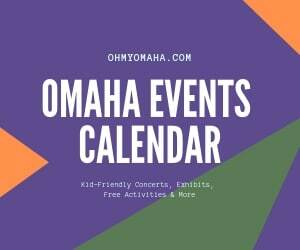 If you have an event to add, please leave a comment or contact me at ohmyomaha (at) gmail (dot) com. When: May 1, 10:30 to 11:30 a.m.
Where: Chalco Hills Natural Resource Center, 8901 S. 154th St. When: May 2, 6:30 to 7:30 p.m. When: May 3, 10:30 to 11:30 a.m.
Where: Omaha Public Library W. Dale Clark Main Branch, 215 S. 15th St. When: May 3, 10, 17, 24, and 31, 11 a.m. When: May 3, 6 to 8 p.m.
Where: Omaha Salvation Army Kroc Center, 2825 Y St. When: May 5, 10:15 to 10:45 a.m.
Where: Aromas Coffeehouse at Flagship Commons in Westroads Mall, 10000 California St. When: May 5, 10:30 a.m.
Where: Azria Health Monthclair, 2525 S. 135th Ave. When: May 5, 5 to 7 p.m. When: Saturdays, May 6 through Oct. 14, 8 a.m. to 12:30 p.m. When: May 6, 10 a.m. to 12:30 p.m. When: May 6, 10 a.m. to 4 p.m.
Where: Omaha Creative Institute, 1516 Cuming St. Cost: $35, person or $25, student/teacher/working artist (ages 12+); use promo code to save 25% off camp registration! When: Sundays, May 7 through Oct. 15, 9 a.m. to 1 p.m. When: May 7, noon to 4 p.m.
Where: Werner Park, 12356 Ballpark Way, Papillion, Neb. When: May 7, noon to 5 p.m. When: May 7, 14 and 21, 4 to 6 p.m. When: May 12-14; hours are May 12, 2 to 8 p.m., and May 13 & 14, 9 a.m. to 7 p.m. When: May 12, 5 to 8 p.m. When: May 12, 7 p.m. When: May 13, 10 to 11 a.m. When: May 13, 10 a.m. to 1 p.m. When: May 13, 1 to 3 p.m. When: May 14, 10 to 11:30 a.m. Cost: $40 for adult members and $35 for child members (3-11); $45 for adult non-members and $30 for child non-members; FREE for children younger than 2. Reservations required. When: May 16, 10:30 to 11 a.m. When: May 17, noon to 1 p.m.
Where: Autism Center of Nebraska, Inc., 9012 Q St. When: May 19-21; hours are May 19, 3 to 8 p.m., May 20, 9 a.m. to 8 p.m., and May 21, 9 a.m. to 7 p.m. When: May 19-21 (carnival), parade is May 21 beginning at 10:30 a.m. When: May 22, 8 a.m. to 5 p.m. When: May 26, 5 to 9 p.m. When: May 26 through June 25; performances are Wednesday–Saturday, 7:30 p.m., and Sunday, 2 p.m. Saturday matinees at 2 p.m. on June 17 and June 24. When: May 27-29, 9 a.m. to 5 p.m. Cost: Included with admission, which is (starting May 1) $19.95, adults (ages 12 and over); $18.95, seniors and military adults; $13.95, children (ages 3-11); $12.95, military child; and FREE for children younger than 2. First 800 people through the gate receive goodie bag. When: May 30, 2 to 3 p.m. I love a game plan. That’s why I usually have a bucket list of activities and trip ideas to keep things fun and interesting throughout summer. But, then there’s that pesky budget thing that makes some of the activities improbable. So I have another list of cheap things to do in Omaha. 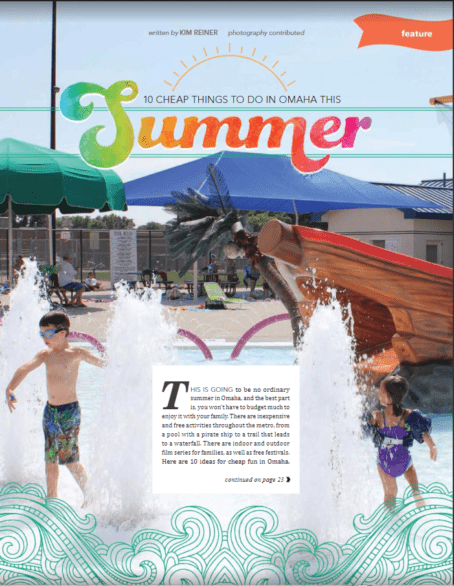 My list was published in Omaha Magazine’s Summer Family Guide recently. So check it out and start planning your summer in Omaha now! 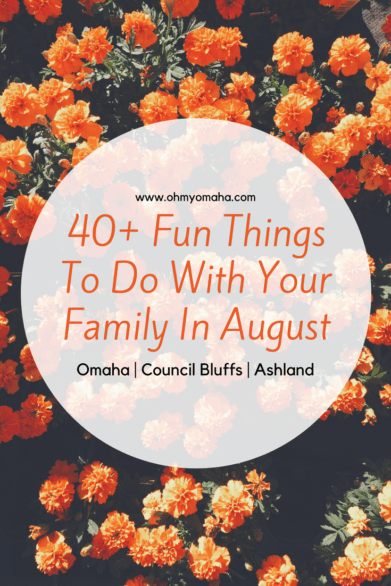 Among my favorite things on the list are my family’s favorite places to hike, the metro’s most unique places to enjoy splashing in water, and the names of some of the many kid-friendly festivals you can find in Omaha. I only got to choose 10, but there are so much more – share some of your ideas in the comments!